Yes I said Maryland Style! 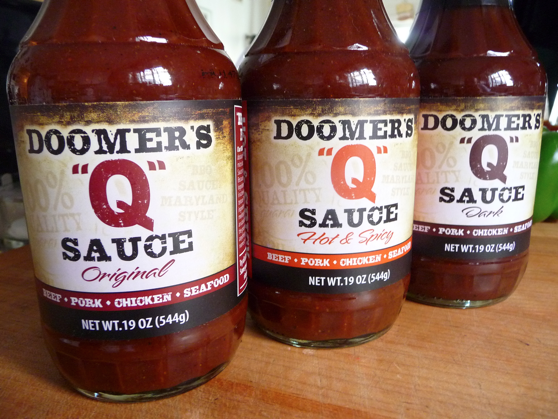 We all know the traditional regional BBQ sauces from Memphis, Kansas City, Texas, the Carolinas, and Georgia and Alabama… but there is a company that has recently launched their Maryland based BBQ sauces – Doomer’s Q Sauces – crafting BBQ Sauce Maryland Style. And owner/creator Todd Dooms and his wife Jo have nailed what a Maryland style BBQ sauce should be. Tomato based with a good balance of both the vinegar and molasses components and with a touch of Worcestershire sauce to really round out the flavor, their first three sauces of Original, Hot & Spicy, and Dark bring a delicious new take on BBQ sauce that screams Maryland!